Guests and volunteers from a group aimed at overcoming loneliness marked a new beginning with a special event at Nairn’s Golf View Hotel. Contact the Elderly, which combats social isolation among older people through tea parties, usually meets at a local volunteer’s home. 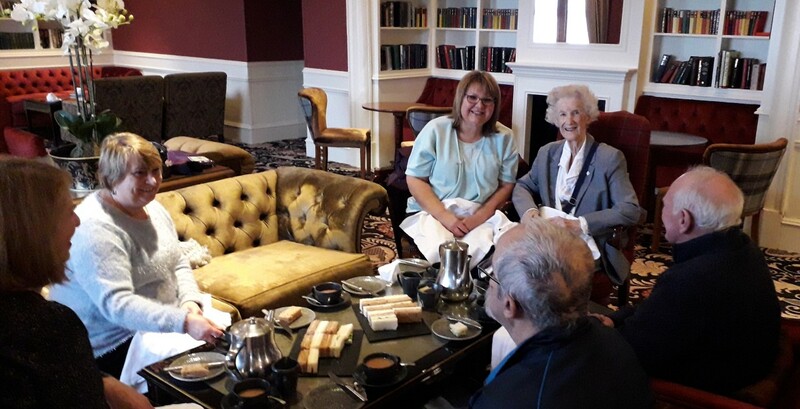 But last weekend the charity celebrated the re-launch of the Nairn group with a luxury afternoon tea at the hotel – and issued an invitation to others in need of company to join them. The charity organises monthly, free tea parties all over Scotland for older people who live alone and don’t have the chance to get out and about much and socialise. Transport is provided by volunteer drivers who chauffeur guests door-to-door. The Nairn group had been temporarily in abeyance but is now fully up and running again and looking for more guests and volunteers to join the party. “We’re thrilled to have the Nairn group running again as it’s such a great opportunity for an older person in need of a bit of company to meet like-minded folk in a friendly and relaxed setting. “It might just be a chat over a cup of tea and some cake but for some people who are socially isolated from the community it can be a real lifeline of friendship. The difference it can make to someone living alone is immense. “We know that the thought of meeting new people can be quite daunting but the atmosphere is always really friendly and welcoming. “Our drivers get to know the guests and can strike up real friendships. It’s just a lovely way to spend a Sunday afternoon and the hosts and drivers get as much enjoyment out of it as the guests.